CLASSIC Enjoy a Guided City Sightseeing, including the iconic Heroes’ Square and an inside visit of the Opera House. Jann will sign her CDs for you. DISCOVERY This evening in Vienna, attend a Royal Waltz Concert for an unforgettable evening of music in an elegant hall. Later, relax on board with live entertainment as you sail to Dürnstein. After dinner do not miss Jann Arden’s concert on board. Join a full day Guided Optional Excursion to Salzburg—the city of Mozart—or a full day Guided Optional Excursion to the picturesque Bohemian town of Ceský Krumlov. Enjoy free time to explore the Golden City of Prague and its surrounding countryside. CLASSIC Take a Guided City Walk, and visit the Hradcany Castle Grounds; see St. Vitus Cathedral, and Old Town’s Astronomical Clock. Spend free time hiking the nearby hillsides, or stay in town to stroll the city of Prague to photograph its stunning cityscape. You might catch the entertaining street performers, visit the market stalls at Charles Bridge, and sample Prague’s famous beer varieties in a local restaurant. This timeless Europe river cruise you will be joined by the Canadian entertainer Jann Arden. 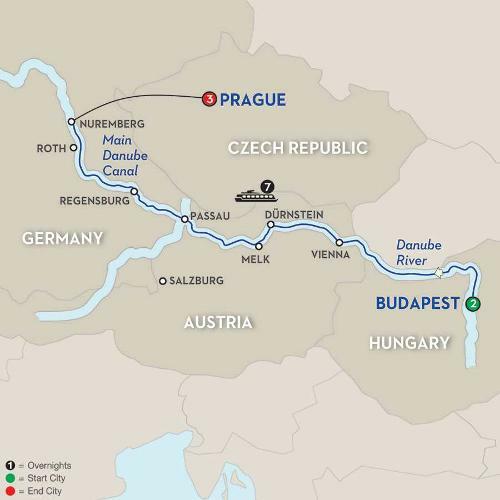 Your vacation begins with two nights in vibrant Budapest, Hungary, then sail along the Danube River with exciting stops in Austria and Germany, and end with two nights in Prague—the capital of the Czech Republic. In Budapest, Hungary’s lively capital, marvel at the eight bridges spanning the river and enjoy an introduction to the city by a local expert who shows you the must-see sights. Vienna, Austria, offers stunning St. Stephen’s Cathedral, the Habsburg Palace, and the Vienna Opera House. In occasion of this special cruise, a concert in Vienna will be included for all. In the heart of the Wachau wine region is Dürnstein, a 16th-century town with charming cobblestone streets and the baroque Stiftskirche with its luminous blue façade. In Melk, visit Austria’s majestic Benedictine Abbey, one of Europe’s largest monasteries, and enjoy a tasting of some of the Wachau Valley’s famous wines. You’ll love a guided walk through Passau, with its narrow streets and beautiful Patrician houses. Further up the Danube River, you’ll come to the medieval walls of Regensburg—the only German city not bombed during WWII. Your last stop is the thousand-year-old city of Nuremberg, where you’ll marvel at the medieval fortifications, extraordinary gothic churches, and the Imperial Castle. Disembark and travel to beautiful Prague, known as the “Golden City.” See the sights with a Local Guide and explore on your own. Stroll across Charles Bridge, mix with the locals on Wenceslaus Square, and shop for hand-cut crystal and art books. A perfect ending to a memorable river cruise vacation! During this cruise, Jann will sign CDs and will held a concert on board.